Any member who has scores recorded from at least one each of: 3D Round, Animal Round, Field Round & Hunter Round is eligible for the Club Championship Award. The highest cumulative score is given the Club Championship Award for each bow style. All others are awarded Club Championship Qualifier Certificates. Awards are handed out at the San Diego Archers Annual Holiday Banquet & Awards Celebration held on the Monday evening following the last shoot of the year. The banquet is FREE to all members (guests are welcome for an additional fee)! This year, all Club Champions for each bow style were given a gift certificate for one free shoot. Mark is the 2017 SDA Club Champion with the highest cumulative score of 1933 + 146 X’s (out of 1988 points & 280 X’s possible) shooting in the Adult Male FreeStyle class! Mark also received a gift certificate for a free one-year SDA Membership! NEW THIS YEAR! SDA Member Larry Lyford has been asking for a couple of years if there was anything we could do for members who show up for LOTS of tournaments throughout the year. 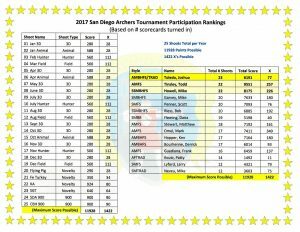 They may not get the highest scores, but they are showing their support for the San Diego Archers and the sport of archery by participating in SDA tournaments once or twice each month. SO! Thank you, Larry. To show our appreciation to our dedicated members who show up for many of our twice-monthly tournaments, we have our new Tournament Participation Champion Award! Anyone who turned in a scorecard for 12 or more of our 25 tournaments (including nine NFAA Rounds, four novelty shoots & two 900 Rounds) in one calendar year will be awarded a gift certificate for one free shoot. Anyone who turned in scorecards for 22 or more shoots this year, was awarded a free annual SDA membership and free shoot! NOTE: Since this is the first year for this award, it is still a work in progress. We’d like a better name for the award and need to define the rules of qualification better. 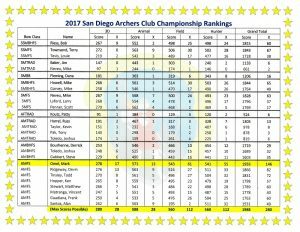 If you have any ideas or recommendations, please drop us an email at: info@sandiegoarchers.com. Also, in the rush to tally the shoots & scores, an error was made in the final Champion results. Bow Hunter Freestyle categories! Well done, Joshua! !